MORE CHANNELS… Lifeline Basic Package expanding and more. GET READY! Rainier Satellite will be announcing additions to our lifeline basic package. What does this mean to existing or new Rainier subscribers? These additional channels will be added at no extra cost to the lifeline basic package. All current or future subscribers will receive them with their annual subscription. But that not all… Other new services will be launching too either as ala carte’s or in add on packs. 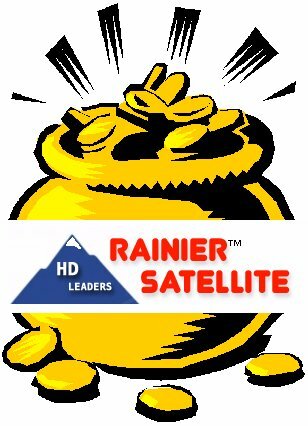 Rainier Satellite has very been busy acquiring many additional channels that will be announced and launched soon. Please keep your eyes here at our news page for the latest and additional updates. 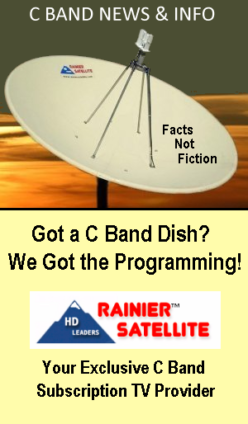 C BAND SATELLITES FUTURE IS BRIGHT WITH RAINIER SATELLITE! Posted on November 23, 2016 December 2, 2016 Author rainiergroupCategories Rainier NewsTags 4DTV, 4k TV, C Band HDTV, C band programming, c band provider, directv, dish network, hd c band programming, powervu, programming center, rainier satellite, Satforums, Skyvision, SkyXpress, SRL, TVROSATLeave a comment on MORE CHANNELS… Lifeline Basic Package expanding and more. Here’s your last chance to get the highly acclaimed D9865 HD receiver for this special LOW LOW price. Full price resumes once its sold. Early Black Friday D9865 Receiver Sale Has Started! Black Friday comes Early for Rainier. Here is your chance to get the highly acclaimed D9865HR HIGH DEFINITION RECEIVER for an unbelievably low low price! 3 receivers are available for this price. ACT FAST because when they’re gone they’re gone! These receivers include our $74.99 data preload at no additional cost. No self programming needed. NOTE: Stock is low, order before they are gone. 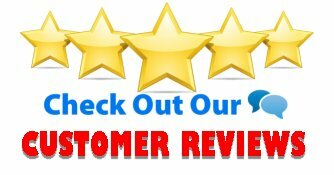 Posted on November 11, 2016 November 15, 2016 Author rainiergroupCategories Rainier NewsTags 4DTV, 4DTV Shutdown, 4k TV, black friday, C Band HDTV, C band programming, c band provider, c band satellite, C band Satellite Dish, cable tv, cisco, directv, dish network, fta, hd c band programming, NPS, powervu, programming center, rainier satellite, Satellite Guys, satellite programming, satellite receivers limited, Satforums, skyexpress, Skyvision, SkyXpress, SRL, TVROSATLeave a comment on Early Black Friday D9865 Receiver Sale Has Started! Please tune your Rainier D9865H receiver to suggested preset 13, acquire, then select Channel 5. 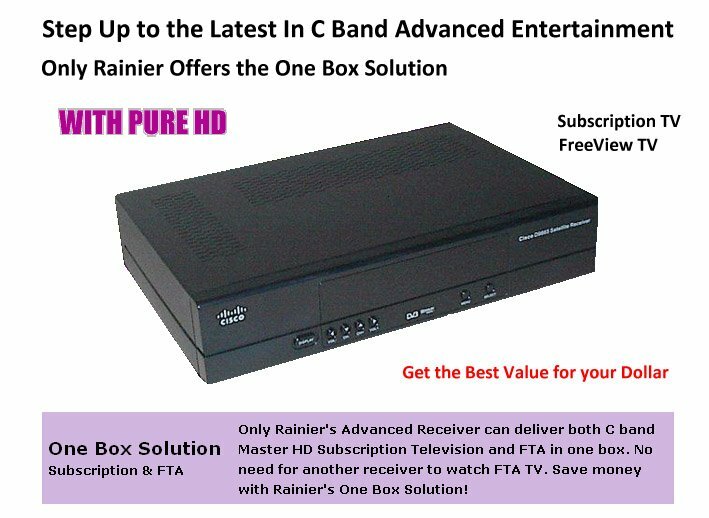 For a short period of time you can watch one of the future Rainier Gold pkg’s channel offerings in Pure HD. Enjoy! Subscribers if you need help with this call our tech support line at 509-477-9270. Have your name and UA number ready when you call. Posted on November 8, 2016 November 9, 2016 Author rainiergroupCategories Rainier NewsLeave a comment on Sneak Peak of Gold! Some may remember our Super Sale last Christmas when Rainier Satellite acquired quite a few Fully Reconditioned by Cisco D9865H HD Receivers direct from Cisco and sold them for a low low price. Rainier has got our hands on 3 more. We will be selling these in a special pre Black Friday sale starting soon. The way this special offer will work is they will be sold at this low price on a first come first serve basis. When they’re gone they’re gone. If you’ve been thinking of upgrading to Rainier this is your chance to for a super Low Low price. 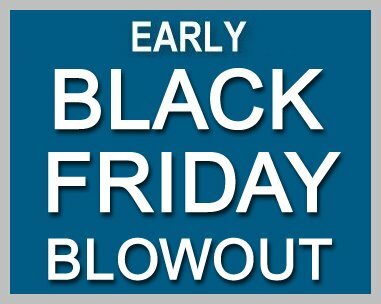 Details and when the special sale starts will be posted here on our News page very soon. So keep your eyes open since you will have to act fast, because at this price they will be gone in a flash.